As a backer of the PocketCHIP Kickstarter I received the PocketCHIP a couple of months ago. For those who don't know, PocketCHIP is a very portable Linux computer. It comes in a case complete with keyboard and screen. After receiving it I played with it but it soon ended up in the drawer. PocketCHIP is very nice and all but I just couldn't think of a killer app for it. Recently however I saw a YouTube video of SuperHouseTV who used PocketCHIP to reprogram Arduino's on remote places. This inspired me to get my PocketCHIP out of the drawer and do something useful with it. In this blog post I describe three different purposes that the PocketCHIP can be used for. PocketCHIP, Arduino and breadboard peacefully together on my workbench. The PocketCHIP can be a very basic mp3-player. I first tried mpd with mpc as client but it was too much of a hassle. Next I installed mplayer and it worked flawlessly. I noticed that the audio stream was interrupted when I did other things on the PocketCHIP (running CHIP 4.3) diminishing the usability. Hopefully this will change when the CHIP software will be optimized in the future. NOTE: The mplayer software is more than an audio player in fact it's a very capable media player. Next I use simple surf webbrowser to stream the video from the Pi to the screen of my PocketCHIP. and presto a video stream of my back yard is shown on the PocketCHIP display. Keeping an eye on my backyard with the PocketCHIP. as mentioned above the PocketCHIP can be connected to an Arduino to (re)program it. But I took it a step further. On the top floor of our house I have a hobby space. The Linux laptop (Puppy Linux) in the hobby space is very old and I'm unable to install the Arduino IDE on it. So I have the PocketCHIP with Arduino software installed connected with a USB cable to my Arduino UNO. 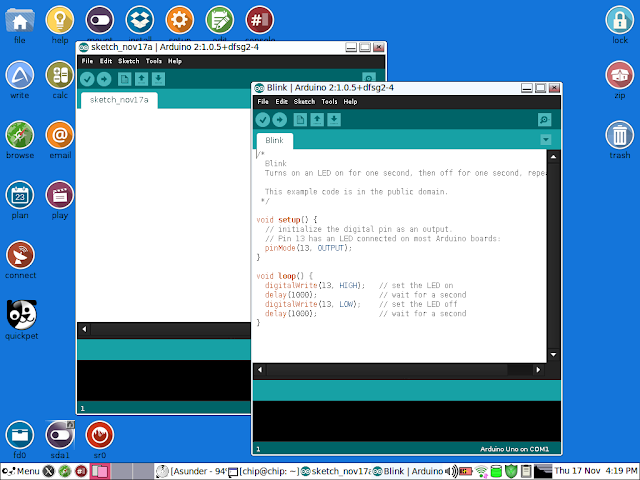 With SSH I remotely connect my Linux laptop to the PocketCHIP and program the Arduino making use of the keyboard and screen of the laptop. This works great. 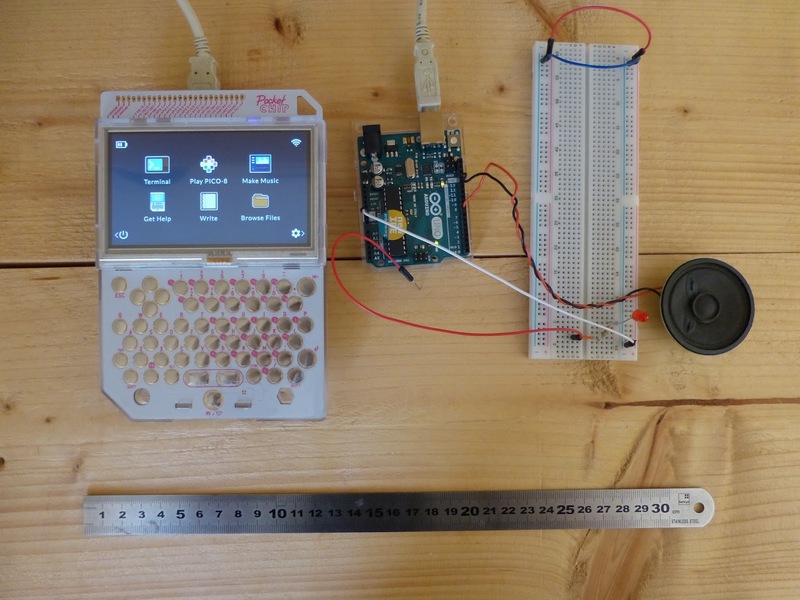 To compile and upload the sketch from the PocketCHIP to the Arduino. Call me crazy but I really love this. Working with the Arduino IDE on my laptop but running on the PocketCHIP. 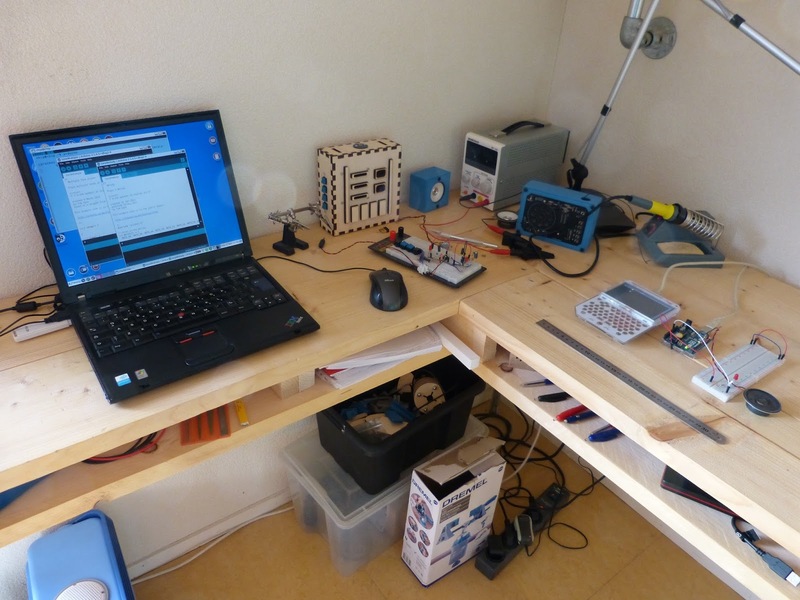 Overview of my workbench with the Linux laptop on the left and PocketCHIP and Arduino side by side on the right. These three purposes of the PocketCHIP reignited my interest in the platform. The PocketCHIP has gotten a permanent place on my workbench which is much better than lying around in a drawer. I'm use it almost on a daily basis to program my Arduino. In the next months I hope to give some more tips on PocketCHIP and the things you can do with it (other than gaming).